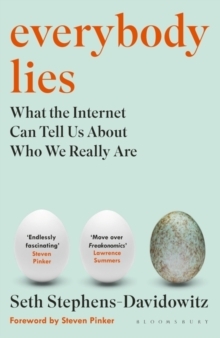 THE NEW YORK TIMES BESTSELLERAN ECONOMIST BOOK OF THE YEAR 2017Insightful, surprising and with ground-breaking revelations about our society, Everybody Lies exposes the secrets embedded in our internet searches, with a foreword by bestselling author Steven PinkerEverybody lies, to friends, lovers, doctors, pollsters - and to themselves. In Internet searches, however, people confess their secrets - about sexless marriages, mental health problems, even racist views. Seth Stephens-Davidowitz, an economist and former Google data scientist, shows that this could just be the most important dataset ever collected. This huge database of secrets - unprecedented in human history - offers astonishing, even revolutionary, insights into humankind. Anxiety, for instance, does not increase after a terrorist attack. Crime levels drop when a violent film is released. And racist searches are no higher in Republican areas than in Democrat ones. Stephens-Davidowitz reveals information we can use to change our culture, and the questions we're afraid to ask that might be essential to our health - both emotional and physical. 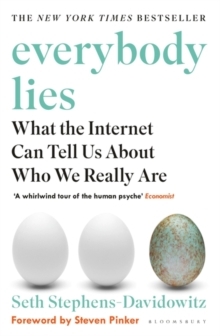 Insightful, funny, and always surprising, Everybody Lies exposes the biases and secrets embedded deeply within us, at a time when things are harder to predict than ever.